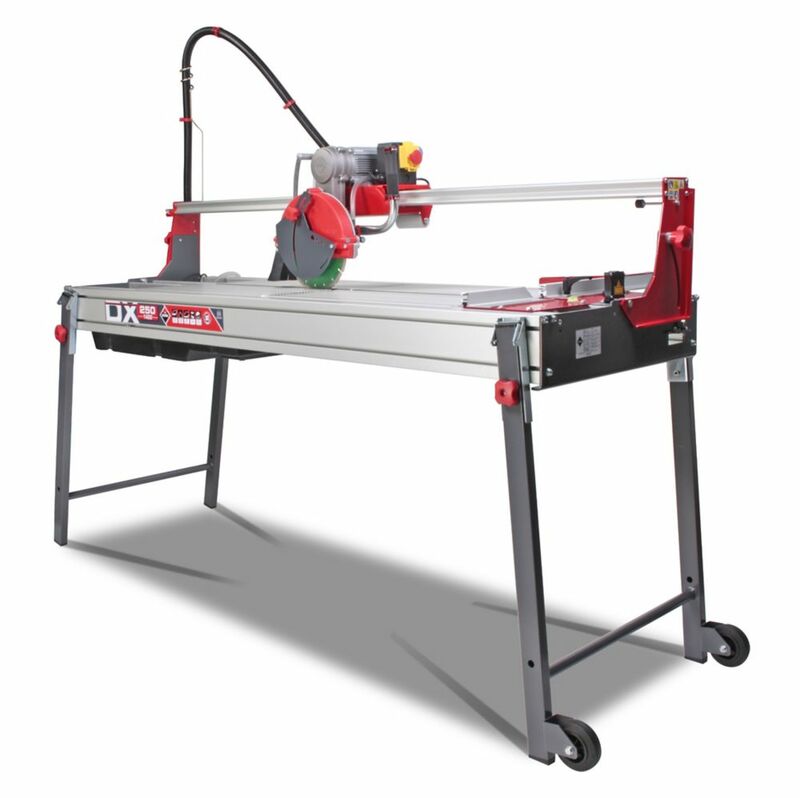 The DX-250-1000 PLUS Laser&Level is a tile saw with a mobile head, equipped with a plunge effect to give professionals great versatility in cuts. The DX-250 PLUS has a motor assembly, mounted on sliding bearings, offering maximum precision and reliability that helps to obtain perfect finishes. The aluminum structure of the DX-250 PLUS Laser&Level is lighter and offers high resistance to conditions in construction. Thanks to the protector that includes the cutting head, the DX-250 PLUS tile saws can hold blades of all types. The DX-250 PLUS work with 10 in. Blades included. The system of retractable legs offers extra protection during transport and storage of the tile saw. And wheels facilitate handling over short distances. Maintenance of the DX-250 PLUS tile saws is minimal, daily cleaning is very practical and easy due to their removable tables and trays. The DX-250 PLUS Laser&Level includes a 2 mW power laser that facilitates cutting visibility and positioning. The QEP Manual Tile Cutter is specifically designed for cutting ceramic tile up to 14-inches square and 10-inches diagonally. The simple score and snap process is a quick way to rip and diagonally cut tiles while the dual, chrome-plated steel rails and the 1/2-inch tungsten-carbide scoring wheel are designed for the easiest scoring and fastest cutting. The durable powder coated steel base and rubber pads provide a slip free and sturdy base, and the long, high leverage handle makes cutting simple. The 10 In. Continuous Rim Diamond Blade is the perfect tool for cutting concrete blocks, tiles and even marble. Designed for accurate cutting with minimum chipping, this heavy-duty blade is made with a wet standard continuous rim. Made as a replacement for your old wet saw blade, these blades are made for long-lasting blade life and paramount cutting performance. Get the right saw blade for your tiling projects with this 10 In. Rod Carbide Saw Blade. Made to fit into your hacksaw or coping saw, this blade is made to cut through tile, making the job quick and easy. Designed to make cutting angles into tile easy, this blade features ground tungsten carbide for long-lasting durability. DX-250 Plus 1000 120-Volt Laser and Level Tile Saw The DX-250-1000 PLUS Laser&Level is a tile saw with a mobile head, equipped with a plunge effect to give professionals great versatility in cuts. The DX-250 PLUS has a motor assembly, mounted on sliding bearings, offering maximum precision and reliability that helps to obtain perfect finishes. The aluminum structure of the DX-250 PLUS Laser&Level is lighter and offers high resistance to conditions in construction. Thanks to the protector that includes the cutting head, the DX-250 PLUS tile saws can hold blades of all types. The DX-250 PLUS work with 10 in. Blades included. The system of retractable legs offers extra protection during transport and storage of the tile saw. And wheels facilitate handling over short distances. Maintenance of the DX-250 PLUS tile saws is minimal, daily cleaning is very practical and easy due to their removable tables and trays. The DX-250 PLUS Laser&Level includes a 2 mW power laser that facilitates cutting visibility and positioning.